We’d love your help. Let us know what’s wrong with this preview of Victory of Eagles by Naomi Novik. Naomi Novik's triumphant debut, His Majesty's Dragon, introduced a dynamic new pair of heroes to the annals of fantasy fiction: the noble fighting dragon Temeraire and his master and commander, Capt. Will Laurence, who serves Britain's peerless Aerial Corps in the thick of the raging Napoleonic Wars. Now, in the latest novel of this dazzling series, they soar to new height Naomi Novik's triumphant debut, His Majesty's Dragon, introduced a dynamic new pair of heroes to the annals of fantasy fiction: the noble fighting dragon Temeraire and his master and commander, Capt. Will Laurence, who serves Britain's peerless Aerial Corps in the thick of the raging Napoleonic Wars. Now, in the latest novel of this dazzling series, they soar to new heights of breathtaking action and brilliant imagination. It is a grim time for the dragon Temeraire. On the heels of his mission to Africa, seeking the cure for a deadly contagion, he has been removed from military service—and his captain, Will Laurence, has been condemned to death for treason. For Britain, conditions are grimmer still: Napoleon's resurgent forces have breached the Channel and successfully invaded English soil. Napoleon's prime objective: the occupation of London. Separated by their own government and threatened at every turn by Napoleo's forces, Laurence and Temeraire must struggle to find each other amid the turmoil of war and to aid the resistance against the invasion before Napoleon's foothold on England's shores can become a stranglehold. To ask other readers questions about Victory of Eagles, please sign up. Recommends it for: fans of historical fiction. With each book, I have a clearer understanding about what kind of series this is. I will never recommend this series to fantasy readers. If anything, I will recommend this series to historical fiction readers. Yes, there are dragons, a completely fantastical element that is the focal point in the storytelling. However, the dragons themselves have their own personalities and histories. The issues that occur in the story are military based and more in line with problems arising in historical fictio With each book, I have a clearer understanding about what kind of series this is. I will never recommend this series to fantasy readers. If anything, I will recommend this series to historical fiction readers. However, the dragons themselves have their own personalities and histories. The issues that occur in the story are military based and more in line with problems arising in historical fiction rather than in a fantasy story. Having said that, as someone who adores historical fiction, I really enjoyed this instalment of the series. The story continues, and I found myself swept away by it, as well as by the words of Novik, who suits this genre of historical fiction. My only complaint is that I wish there was an obvious distinction between the voices of Lawrence and Temeraire. If you gave me a passage from either, I would not be able to recognise who the voice belongs to. It wasn’t confusing as to whose thoughts we were following, but that distinction would have made for a much more enjoyable read. I will be remiss not to mention how much I adore Temeraire. He is such a great character! He just might be my favourite dragon. And his relationship with Lawrence is so… darn… cute! Out of the five Temeraire book I've read, this is my 2nd favorite (after book 1). Every time I read one of these books I fall in love with Temeraire all over again - best dragon ever! Not much else to say about it a this point -if you're considering reading Victory of Eagles, you already like the series. OH - PS - I love the narrator on the audiobook. He sounds exactly how I imagine Temeraire to sound. This review has been hidden because it contains spoilers. To view it, click here. I made some pretty incredible noises when I opened this book and realized that I was getting TEMERAIRE'S POV -- but actually, oddly enough, that didn't end up being my favorite part of it! I wanted Temeraire's sections to be a little more distinct from Laurence's than they were, I think. I guess I'd just gotten so used to the idea that dragons think very differently from humans that I wanted that to be clearer in the narration. Laurence's enormous pit of despair at being a traitor was pretty fant I made some pretty incredible noises when I opened this book and realized that I was getting TEMERAIRE'S POV -- but actually, oddly enough, that didn't end up being my favorite part of it! I wanted Temeraire's sections to be a little more distinct from Laurence's than they were, I think. I guess I'd just gotten so used to the idea that dragons think very differently from humans that I wanted that to be clearer in the narration. Laurence's enormous pit of despair at being a traitor was pretty fantastically done, although it made for all kinds of sadness while reading -- and gyah, the bit where Jane was like, "So btw, Will, you could have been SUBTLE and still saved all those dragons instead of, like, BEING A HUGE DAMNED MORON," was really a slap to the face for Laurence and the reader both -- it really highlighted how great a job Novik did at the end of Empire of Ivory in making it seem as though there was no other choice for Laurence or for Temeraire than to act the way they did. So, at the end of Empire of Ivory, Laurence and Temeraire agree to commit treason to deliver a cure to a draconic plague to France -- Temeraire feeling that the lives of thousands of innocent dragons isn't worth victory of the war, and Laurence agreeing. Laurence then wishes to return to Britain, despite knowing he will be imprisoned or hanged for it, and Temeraire confined -- his own honor prevents him from staying in Europe, either as a French officer or a civilian. The book picks up several So, at the end of Empire of Ivory, Laurence and Temeraire agree to commit treason to deliver a cure to a draconic plague to France -- Temeraire feeling that the lives of thousands of innocent dragons isn't worth victory of the war, and Laurence agreeing. Laurence then wishes to return to Britain, despite knowing he will be imprisoned or hanged for it, and Temeraire confined -- his own honor prevents him from staying in Europe, either as a French officer or a civilian. The book picks up several months later. Which I appreciate for two reasons. First, it give us a chance to see how dragons organize themselves on their own -- the breeding ground dragons are pretty much left to their own devices as long as they eat and mate and don't cause trouble. One of the dragons we meet, Percitia, is a mathematically inclined and quite clever dragon who refused to serve in the military because she didn't see the sense of getting shot up. Second, it gets to the interesting bit -- where Napoleon and Lung Tien Lien invade Britain -- quickly. Laurence, imprisoned on a ship, is presumed dead for a short while, long enough for Temeraire to be quite put out, and decide that he needs to fight Napoleon, and talks the rest of the dragons (ferals, captured dragons, some old retirees, and ones that just refused to fight) into forming their own flight to go fight. Well, here we go. It definitely feels like we are getting close to the final stretch in this series. Victory of Eagles certainly has that “setting up for the endgame” feel to it, especially as the playing field starts to shift to equality, pretty much for the first time. England has always been reactive to Napoleon’s tactics and numbers, but we finally get a sense of strategy and forethought from our British military leaders (a nice switch). Picking up shortly where Empire of Ivory left off, we s Well, here we go. It definitely feels like we are getting close to the final stretch in this series. Victory of Eagles certainly has that “setting up for the endgame” feel to it, especially as the playing field starts to shift to equality, pretty much for the first time. England has always been reactive to Napoleon’s tactics and numbers, but we finally get a sense of strategy and forethought from our British military leaders (a nice switch). …chapters from Temeraire’s point of view. I daresay that this has been a long time coming, and I am glad that we are finally at the point where we get to see things from his perspective. While Laurence was by no means a bad main character, the world definitely felt smaller due to only seeing things from his point of view. Temeraire has always been a rich and detailed enough character that he could stand on his own, and in Victory of Eagles he gets to do just that. Not that he hasn’t had a voice before, but now we are privy to his thought processes as well, some of which are downright amusing. It’s interesting to see the differences between the lifelong patriot Laurence, and the progressive leanings of his “British by association” dragon. “For King and Country” is the stance that has been instilled into the fiber of every British officer, which is a mindset that they stick to like glue even when the rules or expectations are outdated or useless. But Temeraire sees right through the social expectations and vagaries of command & politics, and just wants simple answers to his simple questions. He’s like a child, without a filter, unfazed (though frequently slightly confused) by the socio-political nightmare of a country at war. As such, his chapters stand as a good counterpoint to Laurence’s. We see things as they are, and then we see things as they could/should be. It’s an interesting dynamic that helps keep the narrative fresh. It must be said, however, that even though Temeraire is given his own chapters, Laurence still has the greatest character arc in this novel, as we see the consequences of his decisions start to make him hardened, bitter, and ultimately disassociated from everything around him. Tharkay makes a return (yay! ), but only in a small, albeit, pivotal role. Iskierka & Granby are back, and she’s just as feisty and egotistical as always (and he still at the mercy of her whims). We also get introduced to Perscitia, a new cross breed dragon who becomes sort of the logistician/tactician for our band of British misfits. She’s nearly as excitable as Iskierka, but with a focus on numbers and problem solving as opposed to pyromania. She’s fun, and a great foil to Temeraire, as they both think they are correct on all things mathematical. I hope we see more of her going forward, but I’m not going to hold my breath. This series definitely gives you some cool supporting characters to root for, and then pulls them away just as soon as you get comfortable with them. Or they may make a return, but in a much more diminished role that is ultimately disappointing. The rest of the established supporting cast are relegated to just a few sentences or paragraphs each. The dragons finally get their voices heard in regards to their treatment, even though it’s done at about the worst possible time. But, given the British mindset towards dragons and military service in general, there probably wasn’t any other way for them to get some concessions. I’m glad we are moving forward on that front, as it’s now one of the central themes in the overarching story and definitely needed some kind of progress. It’s also amusing to see just how happy and full of themselves the dragons get with their new roles and responsibilities. Can I give this six stars? It's the best book in the series since His Majesty's Dragon, and I've enjoyed them all. No spoilers here, but I read this entire book with my heart in my throat. I came away thinking what an incredible commentary it was on how the right choice isn't necessarily the easy or popular one, and how making a moral decision can still exact an unbelievably high cost. I admire Novik so much for never taking the easy way out, for making her characters pay the consequences for th Can I give this six stars? It's the best book in the series since His Majesty's Dragon, and I've enjoyed them all. There will be spoilers in this review for the last book in this series Empire of Ivory and the information the blurb on the back of this book provides. After being left on a bit of a cliffhanger in the last book I was relieved to finally have time to read this and find out about the consequences of Temeraire and Laurence's so called treason of preventing the slaughter of thousands of enemy dragons through poison. Temeraire and Laurence spend about I third of this book separated and it was really fascinating to see as this is the first time you really see them act independently of each other and while I adore them together watching Temeraire really develop as a leader was a lot of fun. Experiencing things from his perspective was also a nice change of pace. There is a good mixture of action and plot/character development in this novel, so there is alway something to keep you turning the pages. There were so many returning characters in this novel and it was lovely to see people that were left in England while Temeraire and Laurence have been travelling the world. And some that were less lovely to see but no less interesting for it. There was also a lot of emphasis put on dragon rights in this novel and you get to witness people who haven't had much experience with dragons realizing that dragons are actually thinking and feeling creatures with minds and stubborn personalities of their own. Considering how this novel ended I'm very curious to see how this theme is developed in the next few books. I enjoyed this installment of the Temeraire series, but I had to take a big break after book 4. This is the type of series that gets a little repetitive if you try to read the whole series at once, but it is still a great series that takes you to many different places in the world in the time of Napoleon. It is wonderful how well the fantasy element fits in with the history! It really was a step up again from the last two books, and I bought book 6-9 right away too now. The circumstances were not ordinary. Laurence was a man already dead in law. After the way things ended in the last book for Laurence and Temeraire, I was a bit scared for them in the beginning of this one. This series proves that it’s not necessary to have romance as the main relationship between the characters in order for the story to be interesting. Friendship is an interesting relationship to explore in the books especially when it is between a human and a dragon. There was nothing more heartwarming than seeing Temeraire and Laurence always thinking about the other no matter where they were, close or apart and always worrying about the others comfort first. Temeraire gave a low joyful cry and curled around him tightly and said, Oh, Laurence; I shall never let anyone take you from me again. It was so great witnessing the way Temeraire keeps growing as a character with every book, the trip to China clearly has changed him for the better. Now that he has experienced a different way of living for the dragons and is able to compare it to the way he lives, Temeraire began to actively fight for a better way of living for himself and his friends and it was a very important moment when he had to stand alone and make difficult decisions. But he was quite alone. He trembled, but there was no use being cowardly; there was no-one to help him, and he must decide. With each new dragon that we meet there is something new and peculiar we will experience when we follow them in their everyday life. Perscitia with her war tactics shows how one can contribute to a battle without fighting, as always each dragon has something new to be perplexed about with human behavior be it a newborn child, who compared to dragon eggs can’t stop crying or a bookworm with her unusual reading behavior. Men like to be unhappy sometimes, he offered. My second Captain would come sit under my wing with a book and weep over it, most evenings. I thought at first she must be wounded, but she told me not to fret at all, she liked to do it; and the next morning she would be right as rain again. I think the dragon who got the most attention in this book is none other than Iskierka, who with her feistiness and big ego manages to annoy almost everyone including Temeraire. Their banter is always so funny to read and I don’t know about anyone else but i ship them, their different characters would make an interesting couple and Temeraire’s experience would help tone down a bit Iskierka. I have decided that you may give me an egg. Oh! Temeraire said, swelling with indignation, how very kind! I am to be honored, I suppose. Well, I am much richer than you are, she said, and also I can breathe fire, so you ought to be. I really hope to see more of them together in the next book. This book is the 5th one in the Temeraire series by Naomi Novik. I found this a very enjoyable series. The little dragon is all grown up and working some things out on his own. His attachment to his human is still binding and very sweet. Speaking of his human, I really like Lawrence. Even with his British stiffness, he is easy to like and flexible to a certain extent. I think his personality plays well off of the other humans and even the dragons. Victory of Eagles is the fifth book in the Temeraire series. I really enjoyed this one, at least as much as the first book. Unlike the fourth book, there weren’t any niggling annoyances to distract me from a story that I had been otherwise enjoying. There was a small change in the storytelling format that I particularly loved. I’m going to put the rest of my review within spoiler tags so I can freely discuss some things in more detail. (view spoiler)[About half of the book is written from Temerai Victory of Eagles is the fifth book in the Temeraire series. I really enjoyed this one, at least as much as the first book. Unlike the fourth book, there weren’t any niggling annoyances to distract me from a story that I had been otherwise enjoying. There was a small change in the storytelling format that I particularly loved. (view spoiler)[About half of the book is written from Temeraire’s perspective. This was the aforementioned storytelling format change that I loved so much. The previous books have all been from Laurence’s perspective, only allowing us to see what Temeraire thinks and feels by observing and listening to him through Laurence’s eyes and ears, and relying on Laurence’s interpretations. That always niggled at me a little bit, because it's unrealistic for Laurence, who had never been around dragons until recently, to perfectly interpret Temeraire’s every thought and mood, and yet we’re given little reason to believe his interpretations aren’t always 100% accurate, and they have to be if the author wants us to know what Temeraire’s thinking because we have no other way to learn it. By allowing us to read from both perspectives, Novik opened up her options. We could see some of the private thoughts of each of them that the other was unaware of or didn’t fully understand. The parts near the beginning where Temeraire roused his fellow dragons in the breeding grounds to get organized and go join the war effort were awesome – my favorite parts of the book. I actually wouldn’t have minded pushing off the reunion between Temeraire and Laurence a little longer, just to have gotten more of that. In any case, I really hope Novik keeps letting us alternate between the two characters’ points of view in the rest of the books. The series is called Temeraire, after all! I really liked the brainy dragon Temeraire met at the breeding grounds, Perscitia. She was a great character. She sort of reminded me of Hermione from the Harry Potter books, if Hermione had been a dragon. :) I was disappointed that it doesn’t look like we’ll see her in the next book since Laurence and Temeraire are headed to Australia and it doesn’t seem like she’ll be going. Naomi Novik continues her winning alternative history series with Victory of Eagles. For those fantasy fans who have not read any of her books, you should venture to the local library and get into the books because they are a wonderful combination of history and fantasy. In the last novel in this series, Laurence and Termeraire (his dragon) discovered a cure for an epidemic that was killing all of the dragons. Laurence brought a cure back to England but the lords decided in a little smallpox idea Naomi Novik continues her winning alternative history series with Victory of Eagles. For those fantasy fans who have not read any of her books, you should venture to the local library and get into the books because they are a wonderful combination of history and fantasy. In the last novel in this series, Laurence and Termeraire (his dragon) discovered a cure for an epidemic that was killing all of the dragons. Laurence brought a cure back to England but the lords decided in a little smallpox idea to infect their enemies the French dragons. Laurence and Temeraire gave the cure to the French dragons. In this new novel, Temeraire has been sent to the breeding grounds while Laurence is imprisoned on a brig in the harbor. Laurence is only alive to keep his dragon in line. As those who have read prior books know, the dragons are used by the British as slave soldiers. In this story the French under Napoleon invade England and Laurence and Temeraire are united again to fight for England and thwart the invasion. The authors take on the battle between Wellington and Napoleon is great, and her story moves crisply along. Laurence cannot escape the fact that his conduct was judged treasonous and takes a harrowing mission from Wellington in the war. A stellar tale. Some fantastic battle scenes. And Laurence becomes a more real character, IMHO, as the consequences of his actions catch up with him. In which Temeraire receives lessons both formal and informal about how to be a leader from Field Marshal Arthur Wellesley, whom in our own pages of history we know also as the Duke of Wellington. What is it about Wellington that makes him such a compelling character when he shows up in the pages of a real world/fantasy novel? He is a vivid personality in his limited screen time in a book like Jonathan Strange and here he shows up in the fifth book of the Temeraire series as well, maybe not charac In which Temeraire receives lessons both formal and informal about how to be a leader from Field Marshal Arthur Wellesley, whom in our own pages of history we know also as the Duke of Wellington. What is it about Wellington that makes him such a compelling character when he shows up in the pages of a real world/fantasy novel? He is a vivid personality in his limited screen time in a book like Jonathan Strange and here he shows up in the fifth book of the Temeraire series as well, maybe not characterized exactly the same, but no less vivid. In the middle of a stodgy apparatus that doesn't respect the potential contributions of dragons and a Government that is contemplating surrender to an invading Napoleon - an invasion of England seeming to replace, in this world, the Peninsular War in which Wellington got his fame - Wellington is the one leader who says, "Ah, screw this Napoleon guy, let's figure out how to beat him." And then he does so, of course, in part with the help of Laurence and Temeraire, because Wellington, since he's Wellington, is willing to make use of dragons in a new way, though of course all the while he's grumbling and threatening Laurence, who is technically maybe kind of supposed to be executed for treason. Things, as always, are a bit more complicated than that. After all, Laurence and Temeraire start of the book not even in the same place. Laurence is detained in London, having been busted out of the Aerial Corps for going along with Temeraire's defiance in stealing the mushroom cure and flying it over to France before their dragons could be sick. Thus, for the first time, the series shifts to Temeraire's POV for a time, and we get half from Laurence and half from Temeraire during the whole of the book. It's a good way to keep things fresh as this series starts to enter a different phase. Up until now, we've had only Laurence's thoughts and Temeraire's statements to go on, and now the addition of the dragon adds new perspective to the whole of the story. There has been a lot of Laurence trying to understand what drives Temeraire, and now we get to see Temeraire's slow realization of exactly how much Laurence has given up for his sake. Sometimes this involves hilarious misunderstandings and other times it's really touching, like Temeraire's complete confusion over how Laurence has no money because it was all seized after a lawsuit brought by slave traders - Temeraire having liberated some slaves in Africa in the previous volume. Through Temeraire, we get an idea of what drives dragons. Not only the ones who are somewhat civilized, but also the more wild ones who are in the breeding ground when Temeraire opens. Sometimes I think this series gets a little too bogged down with so many groups of dragons (a bit like Wheel of Time's many, many Aes Sedai in that way) but the group Temeraire rallies and turns into a dragon militia is interesting. It never quite goes beyond subtext, but there's something of the classic Hobbes "state of nature" vs. man (or dragon) coming together to form a society. Do the dragons want to be civilized? Should they be? Is it right to have these beautiful creatures turned into instruments of warfare in which they are assisting in killing their fellow dragons? In this way, the world-spanning journey of the previous books is important. The subject of what to do with dragons in England is of greatest interest to the series at large, but it was significant to see how things are handled in other places first. I mean, all of this is there in the background. If you just want to read about descriptions of battles involving dragons, there's plenty of that too. And it remains cool to see all of the little dragon world-building touches - like Maximus showing up in the same place as a different Regal Copper companion of Temeraire and the two of them are totally about to fight until Temeraire gets involved. Or the venerable old Longwing Gentius, who's been through three captains (service that seems to have stretched him back into the 1600s,) getting all excited and feeling young about going into battle again. And the curious English dragon who doesn't want to fight at all but seems to have a very keen tactical mind. Series books always run a big risk: They can feel "phoned in" or less than exciting to the writer; or they can feel place-holder-y, like the book is a bridge to the next one in the series, without an obvious and unique place in the series's created universe. A little of both happens here. I wasn't in any way doubting that Novik would take me back into Temeraire's alternative Earth with dispatch; she certainly did that. This is a writer who knows what mood she wants to create and how to create it. She also knows her history, and brings characters to life who fit into that history, whether based on fact or wholly imagined. So why complain? Because the trip to Africa, from the previous book, feels contrived; the characters who join Tewmeraire's family there are virtually ignored here. Because the actions of the British government are presented as faits accomplis and then the action starts, in what feels to me like a very unrooted in the series's reality fashion. Because the entire book is a search-in-progress; half the book, grudgingly okay, but the WHOLE THING?! Asking too much of my patience, Ms. Novik. This novel shows that a great set-up a great novel makes. The excellent, game-changing ending of the previous novel dictates the repercussions here and it's as good as expected, or maybe even better. The best Temeraire novel by far, Victory of Eagles takes those elements of the previous novels that really worked for me (characterisation, conflict of values, honour versus pragmatism, dragons being adorable) and adds unprecedented depth to the characterisation by making the characters face hard cho This novel shows that a great set-up a great novel makes. The excellent, game-changing ending of the previous novel dictates the repercussions here and it's as good as expected, or maybe even better. 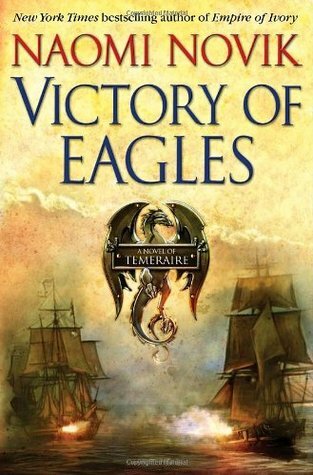 The best Temeraire novel by far, Victory of Eagles takes those elements of the previous novels that really worked for me (characterisation, conflict of values, honour versus pragmatism, dragons being adorable) and adds unprecedented depth to the characterisation by making the characters face hard choices and terrible situations. Temeraire gains new maturity, and Laurence new depth, and on top of that the terror of warfare is finally addressed more fully. Considering the previous treatment of war in Temeraire novels, which seems light and almost nonchalant in comparison, the Napoleonic invasion allows Novik to truly shine and stretch her wings, metaphorically speaking. This post-treason Laurence is a much more interesting Laurence. And his interactions with Tharkay and their growing affection were a particular highlight. I literally squeed several times - not what I'd expected from these novels. I was filled with a kind of wild glee at Temeraire's peremptory actions on behalf of the nation. It never occurred to me to consider his fate once Laurence had been condemned for treason or that each might be held as hostage for the other's good behavior. Temeraire on his own gives us a better look at dragon priorities, natural behavior, and capability for adaptation. Here, too, we get down to brass tacks as Bonaparte invades England. Unlike many of the battle oriented parts of the previous books I was filled with a kind of wild glee at Temeraire's peremptory actions on behalf of the nation. It never occurred to me to consider his fate once Laurence had been condemned for treason or that each might be held as hostage for the other's good behavior. Temeraire on his own gives us a better look at dragon priorities, natural behavior, and capability for adaptation. Very emotional but interesting story with the Dragons embroiled in fighting Napoleon and fighting for their rights to pay and rank in the service. Not going to write a lot here, because I covered most of it in my review of 4 years ago, below. Victory of Eagles is a lot of fun because Temeraire takes it into his head to form his own little dragon corps and even request a rank. That’s cool for many reasons. First, he wrests some acknowledgement of dragon sapience from Government. Second, Temeraire discovers that having rank is not all fun and games. Wellesley gives him quite the dressing-down about taking responsibility for one’s subordinates’ actions after Iskierka rushes off. One of the ongoing perks of this series is the way that Temeraire and Laurence misunderstand each other’s worlds. We see more of that from Temeraire’s side this time in his conversations with the other dragons. Gentius is confused by his first captain’s propensity for reading romances. The dragons are all about accumulating shiny things, which is hilarious to me but deadly serious for them. And Temeraire also just doesn’t understand Laurence’s dedication to this idea of honour and how it was necessary to return to Britain to face punishment, even execution, instead of fleeing somewhere more welcoming, like China. This book features some major battles and extensive departures from established history. (You would think Britain’s Aerial Corps would help them win the Napoleonic Wars faster, but Napoleon actually has the upper hand for most of this book!) However, I’d argue that this is all interesting historical background. The majority of Victory of Eagles is, as I outlined above, about Temeraire and Laurence’s relationship. Both have now stepped into the other’s world a little bit. Of course, by the end we’re back on a ship, bound for the wild and uncharted frontier of Australia. That’s exciting! I haven’t read Tongue of Serpents before, so it will be brand new for me. We’ll see how Temeraire and Laurence negotiate this brave new world, and whether Temeraire can continue the struggle for dragon rights. I haven't read book 4 yet, but one of the advantages of Naomi Novik's writing is that this is the sort of series where skipping a single book won't harm your enjoyment of a subsequent volume. As long as you keep up with the major plot points (there was a dragon virus; they found a cure in Africa; Laurence and Temeraire shared it with France as well as Britain and are now traitors for it), it's easy to sink your teeth into Victory of Eagles. Both Temeraire and Laurence were broken at the end of the last book, apparently. Temeraire is consigned to a "retirement" covert while Laurence serves some time on a naval vessel, each being held against the other's good behaviour. Laurence is condemned to hang (although we, as the faithful readers, know at this point that such an event would never come to pass!). Temeraire, as usual, is having trouble comprehending the strange nature of nationalism and the military judicial system. His reactions to the other dragons who live in the covert are humourous. Indeed, the improvements he makes to his own cave are a catalyst that results in Temeraire forming his own "aerial corps" of dragons. Composed of retired fighters, tamed dragons who have never fought, and feral dragons, Temeraire convinces them to join him with promises of treasure and improvements in their quality of life. Novik knows enough of her history to have fun with altering it to suit her purposes. The book begins with Napoleon establishing a foothold in England and proceeding to attempt to quell the countryside and obtain the resources required for feeding his sizable corps of dragons (one of the very few complaints I'd make about this book is the amount of space it devotes to concerns about feeding dragons). Admiral Nelson hasn't died at Trafalgar, but actually dies in the battle at the climax of this book instead--a casualty of a tsunami created by Lien's use of the divine wind. Lien herself plays a rather minor role in this book. Perhaps more plot-driven than character-driven, Victory of Eagles still contains great moments for both of the main characters. As an "outsider", Temeraire can make brutal observations of the folly of humanity. At the same time, he does or says some things we would find questionable or even unacceptable. Laurence, meanwhile, continues to wrestle with his conflicting statuses--both traitor and potential saviour. Novik has much fun pitting one against the other; they act as each other's foils while remaining allies against those who would rend them apart. I disliked very little about this book. Parts of it were slow. As I mentioned above, Novik devotes an inordinate amount of time to matters of food and obtaining enough livestock to satisfy the dragons. I'm willing to forgive her, however, since it is an important plot point, so perhaps it's better to stress it rather than understate its importance and risk criticism for glossing over such a potential plot hole. Fans of the Temeraire series will enjoy this book. It isn't the best of the series, in my opinion, but it's still entertaining. For those new to Temeraire's series, I would naturally recommend reading the first book first--you will be a little confused if you skip all the books before this one! So Laurence was in a funk for much of this book because he's a traitor and whatnot and that's depressing, especially for a man as honorable as he. But about half of the book was told from Temeraire's "perpsective" (that is, still told in third person but from his viewpoint, you knew what he was thinking etc, I'm sure there's a term for that) and that was pretty fun. I like that dragon. And there's so much ACTION in this book! I thought I didn't care much for reading about battles and such, but it was a blast! I don't know why these books aren't movies. I asked that question aloud the other day and Chris was skeptical and I said "but dragons! People love dragons!" and he said "but it sounds cheesy" and I said "but people love cheesy!" And they do! Man, and so many dragon-on-dragon battles in this one! These would all make awesome movies. I just got to this book, since I'm not planning to buy it in hardcover, since it wouldn't fit on my shelves that way. My mother read it before me and complained that it wasn't as good as the previous, since it consisted mainly of logistics; I however think logistics are pretty awesome, and have been known to give up on books which cannot explain to me how the foot-soldiers got from A to B, so this is perfectly all right with me. This book is not, however, rolicking good fun, or not quite so much I just got to this book, since I'm not planning to buy it in hardcover, since it wouldn't fit on my shelves that way. My mother read it before me and complained that it wasn't as good as the previous, since it consisted mainly of logistics; I however think logistics are pretty awesome, and have been known to give up on books which cannot explain to me how the foot-soldiers got from A to B, so this is perfectly all right with me. This book is not, however, rolicking good fun, or not quite so much so as the previous in the series. Given how book four closed (being vague now, so as to avoid a spoiler) this is not precisely a surprise. However, this is the book in which the characters truly make themselves, betray themselves, save themselves, find themselves, and in the process, really get the alternate part of this alternate history going. When Laurence and Temeraire are separated, Temeraire assumes a commission of his own. The introduction of Temerarie's PoV is only briefly disorientating; it is, on the whole, a great addition, because this book is all about consequences--of the recent cliffhanger, but also of Laurence's actions throughout the series, and to see them from without, via a character unaware of that complicated social and moral position, is especially effective. It also keeps this book from becoming too dour--so too When Laurence and Temeraire are separated, Temeraire assumes a commission of his own. The introduction of Temerarie's PoV is only briefly disorientating; it is, on the whole, a great addition, because this book is all about consequences--of the recent cliffhanger, but also of Laurence's actions throughout the series, and to see them from without, via a character unaware of that complicated social and moral position, is especially effective. It also keeps this book from becoming too dour--so too does the breadth of the action and progression of the war. This is almost too neat a book, in the way that reoccurring characters and ongoing arcs tie into the plot, but that would be my only complaint; I loved it, I found it necessary and well-realized and, if less pointedly feel-good than other series favorites, then perhaps more substantial. Great instalment, but not as good as the last one. There's a lot happening in this novel, a lot of new characters, a lot of old characters, in this mix, so sometimes it was just a little bit hard to remember who's who. There's a lot of action as well, but while it is exciting at first, it gets bogged down towards the end. I'm kind of glad their lives have become a lot more complicated and that Laurance wasn't forgiven and sent away with a slap on a wrist. It really give a lot of complexity to the Great instalment, but not as good as the last one. I'm kind of glad their lives have become a lot more complicated and that Laurance wasn't forgiven and sent away with a slap on a wrist. It really give a lot of complexity to the plot and to the character's lives. This volume brings the war home to Britain, and it is ugly, of course. but it's also amazing, that Novik can draw the reader in to issues of supply lines and transportation, and make the very mundane fascinating. A thrilling story which makes the routine discomforts and privations of war more stark. And she never loses her keen moral vision, allowing characters to debate and consider different viewpoints. Brilliant. Recommends it for: Anyone who enjoys Cornwell's Richard Sharpe series or Patrick O'Brian. It's a matter of proving that dragons an Fifth in the Temeraire historical military science fiction series and revolving around a Celestial dragon and his captain. It's a matter of proving that dragons and women are as capable as men and deserving of respect. Temeraire manages some of his pet equalities…yay!…and it's a treat to read of this, for it is embarrassing how humans treat the dragons. Like cattle with no intelligence, no feelings. And then Temeraire rips 'em a new one with some mathematical problem or a bit of philosophy. Yep, he's got 'em over a barrel. He manages to talk a wide range of dragons into helping him. UNharnessed, if you please. And it's adorable how the unit has changed what with Temeraire in command and both humans and dragons attending planning sessions. Gotta give Napoleon credit for respecting dragons. The English are doing their usual, thinking their way is the only way of doing things. And anyone not English — and a male human — is obviously inferior. I mean, why wouldn't one accept that dragons have a better idea as to their capabilities (and not those generals who haven't the slightest clue how to best use them) and allow them to do their own strategizing? They certainly have an excellent example with the brilliant colonel out in the countryside! As for the women captains, lol, Jane certainly has no time for their opinions as to a woman's intellect or capability, lol. She really tore into and ignored them, refusing to accept the men's blusterings. It's also patriotism. Oh, not patriotism to a government that slips and slides around on its promises and has no honor, but patriotism to one's country. Some of that "honor" is the lack of real justice in nineteenth century England and how Laurence's mates were treated right after Laurence came back from France. Laurence's meeting up with Temeraire is too funny. Although, it becomes progressively less funny as Temeraire begins to understand and worry about his captain. Novik very nicely incorporates a dragon perspective on treasure and appearances with Temeraire learning the meaning of chain of command and what responsibility it incurs. All part of Novik's character arc for him, as Temeraire comes to understand more the ramifications of Laurence's committing treason ( Empire of Ivory , 4). It's that dual third-person point-of-view that allows us into Temeraire's and Laurence's thoughts. Temeraire's confusion as to why Laurence is so unhappy when he has every reason to be relieved. Laurence's shame for what he must do with no real hope. On a side note, I'm not sure how the whole gifting thing came up at the breeding pens. Novik didn't lead up to it at all. It was just there. Pen Y Fan is part of Temeraire's "parole". If he behaves, Laurence won't be hung. It's not a promising start, especially when the "neighborhood bully" comes to call. Temeraire is a black Celestial dragon with a divine wind. William Laurence is his captain. Gong Su is the Chinese cook who knows just how Temeraire likes his food. Emily Roland, Jane's daughter, has been a runner. Keynes and Dorset are surgeons. Blythe is the armorer. Fellowes and Allen reappear. Lord Allendale is Laurence's disapproving and now ill father. Jones and Peyle are footmen and Martha is one of the maids on the family estate, Wollaton Hall. George is Laurence's oldest brother. All Laurence's friends have been taken over the coals: Berkeley, Chenery, Jane Roland, Little, and Sutton who rides Messoria, a Yellow Reaper. Worse, First Lieutenant Ferris has been broken. Captain Tharkay is half-British, half-Nepalese, with his fingers in more pies. He's the one who can speak the ferals' language. Arkady is the leader of the ferals. Gherni and Wringe are some of the ferals. Dunne and Wickley had been Temeraire's wingmen but now captain ferals, as they have a a gift for languages. Admiral Jane Roland had been Laurence's lover; she rides Excidium. Frette is Jane's aide-de-camp. Captain Berkley rides Maximus. He and Lily have promised Temeraire that they'll not let the government hang Laurence. Captain Hollin, Laurence's former harness-master, now rides Elsie. Captain St. Germain rides Mortiferus; she was formerly assigned to Gibraltar. Celeritas had been the dragon in charge of training in Scotland. Rightley. Nitidus, a Pascal's Blue whose rider is Captain Warren. Captain Granby is riding the quixotic Iskierka, a Turkish fire-breather with very decided views on what she will and will not do ( Black Powder War , 3). Sipho and Demane are African boys Laurence brought back in Empire of Ivory and are part of Iskierka's crew. …the breeding grounds in Scotland where dragons are sentenc…, er, sent. Mr. Lloyd is the grounds-master. The bossy Perscitia is a cross-breed of a Malachite Reaper and a Pascal's Blue who gave up her captain. She doesn't like fighting, but adores mathematics. Moncey is a Winchester courier; he'd managed to get away from the Corps. Laculla. Requiescat is a bullying Regal Copper. Gentius is an ancient Longwing (Captain Haulding had been the useless officer whose absence made it possible for his real female captain to go up to a real rank). Reedly is a mongrel half-Winchester. Majestatis tries to be fair. Minnow is a feral. Ballista and Armatius are Chequered Nettles. Chalcedony is a Yellow Reaper. Rictus is a Grey Copper. Velocitas, Palliatia, Dirigion, Ventiosa, and Gladius are yet more dragons. Other dragons in the unit include Anglewings. The nasty Lord Mulgrave is the First Lord. Jane Roland wasn't appointed admiral for Dover. That honor went to the incompetent Admiral Sanderson who rides a Parnassian, Annimosia. Admiral Collingwood. Admiral Horatio Nelson captains Victory , the lead ship with the Minotaur , the Prince of Wales , the Neptune , the Superb , and nine more ships-of-the-line. …where Laurence is imprisoned. Captain Puget, Lieutenant Frye, and Midshipman Meed are all that's left. Some of the officers are grateful for Laurence's actions in Empire of Ivory , including Captain Hesterfield, Von Pfeil, Captain Dyhern, Captain Prewitt, Captain Latour, Gounod, and Reynolds. Others despise him: Captain Geoffrey Windle, Captain Miller rides Devastatio in courier service, Maclaine, and Martin who is now part of Orchestia's crew (an Anglewing captained by Fenter) and very much against Laurence and Temeraire. Captain Tom Riley had been a friend of Laurence's and captain of the HMS Allegiance, a dragon transport. Now he's married to Captain Catherine Harcourt who rides Lily ( Empire of Ivory ). They have a son. Poor guy. He had no notion babies must be fed every two hours, and Catherine has gone off to the coast for battle. Lord Purbeck is first lieutenant and despises Laurence. The three eggs are a Yellow Reaper, a cross between a Chequered Nettle and a Parnassian, and Arkady and Wringe's egg. Bertram Woolvey is the man who married Laurence's love, Edith Galman. They have a son, James. Sutton-Leeds is Woolvey's drunk friend. I think Gavins is Lord Holland's man. Darby (a.k.a., Janus) is one of Holland's stablehands. Lady Hamilton is also still in occupied London. I think the emperor, Napoleon, rides Accendare, a Flamme-de-Gloire. Lung Tien Lien is the white Celestial who fled China in Throne of Jade , 2, and now advises Napoleon. Marshals Lefèbvre, Murat, and Davout are in England. Talleyrand is here for a peace conference; Liberté is the dragon he's riding. Grand Chevaliers are the largest of the French heavyweights; Fleur-de-Nuits; Pêcheur-Rayés; Papillon Noirs; Roi-de-Vitesses; Pou-de-Ciels; Garde-de-Lyons; Honneur-d'Ors; Chanson-de-Guerres; Defendeur-Braves; and, Chasseur-Vocifères. The cover is a range of yellows and browns with the dark brown roiling seas and the two battling ships, the flare of the cannons bright against all that dark. The background gradually lightens to a sunny yellow at the top. The author's name is at the top in a shadowed deep orange while the title is bigger and below it in a deep brown. Both are embossed. Just below center is a black dragon, hovering in mid-air, holding a banner with the series information in the same yellow. Can I give this six stars? Can I give it more? “[Maximus] put his head down and said in a conspiratorial whisper, “Tell Temeraire that Lily and I have not forgotten our promise; we will not let them hang you at all."